In order for us to remain healthy, we need to consume specific substances on a regular basis. These substances fit into 6 main categories known as the essential daily nutrients. Not sure of what the 6 essential daily nutrients are? Looking for a little more information on them? Then read on. This article will tell you everything you need to know. While some individuals try to avoid carbohydrates at all costs, the truth of the matter is that they’re vital to a properly functioning body. Carbs help to keep your body energized, promoting good health in both the brain and nervous system. Some foods that are high in carbohydrates include white bread, beans, potatoes, milk, and corn. There are also carbohydrate supplements available to help you meet your daily needs. Protein is needed to strengthen and maintain the body. This nutrient not only helps to build muscle, but bone, skin, and hair as well. You can get protein from a variety of different sources. Popular food sources include eggs, fish, red meat, white meat, milk, peanut butter, beans, and nuts. You can also get protein from supplements such as whey powder. The word “fat” has bad connotations. However, you should know that fats are an essential daily nutrient. Healthy fats help the body to function in a number of ways, working to absorb minerals, clot blood, and promote proper muscle movement. The type of fats you want to consume are unsaturated fats. These can be found in fish, nuts, flaxseed oil, and a variety of other foods. Any supplement containing omega-3 or omega-6 fatty acids is a supplement that’s high in good fats. There are a number of natural vitamins that the body needs in order to thrive. There are 13 essential vitamins in total. These include Vitamins A, K, E, C, D, B1, B2, B3, B5, B6, B7, B9, and B12. Each and every one of these vitamins contributes something to your health, improving everything from your immune system, to your heart, to your skin, and more. 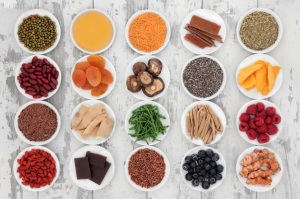 These vitamins come from a wide variety of food sources. If you have a healthy diet, you shouldn’t have any problem getting the vitamins you need. If, however, you’re deficient in any of these vitamins, there are supplements available to you. The human body also requires a daily dose of specific minerals. These minerals include, but are not limited to iron, zinc, calcium, magnesium, and phosphorous. Each and every mineral serves a different purpose, promoting everything from hair growth, to skin growth, to nervous system function, and more. Again, generally, if you consume a healthy, balanced diet, you should get all of the minerals you need. However, if you’re lacking in any minerals, you can get them from supplements. Perhaps the most important of our essential daily nutrients is water. Most human beings can’t survive any more than a few days without water. This is due to the fact that water comprises the majority of our bodies. There are a number of functions served by H2O, from joint lubrication, to hydration, to brain enhancement, to proper digestion, and more. In the United States, clean water is everywhere. There’s no excuse to not be drinking it, and drinking it often. Are you having trouble meeting your daily nutritional needs? Interesting in meeting those needs with supplements? If so, the Feely Center for Optimal Health can help. We offer a wide variety of nutritional supplements, from Vitamin C supplements, to Vitamin D supplements, and much more for Chicago area residents. Take a look at our selection of supplements now!